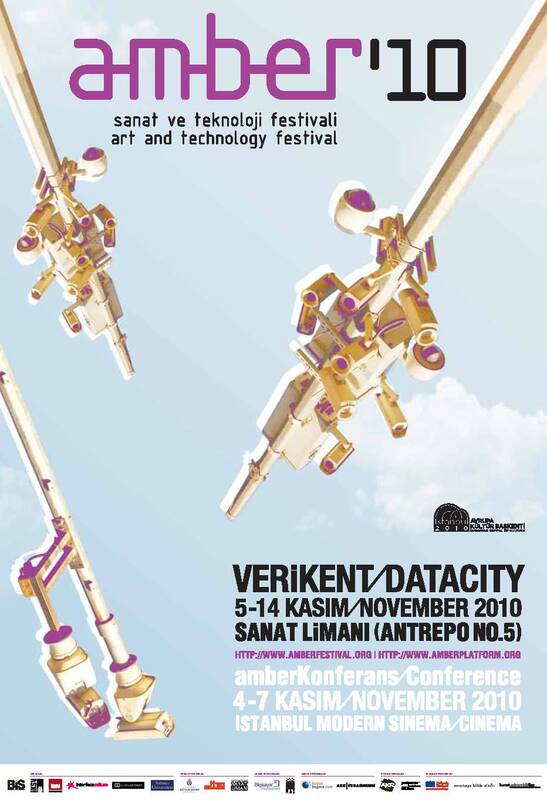 Between November 5-14th, the city of Istanbul hosted the fourth international Amber Art and Technology Festival. The festival explores and questions the impact of technologies on social, cultural, and political domains via artistic practices. This year’s theme was: DATACITY. The Mobile City’s guestblogger Tina Bastajian looks back on a workshop she conducted at the conference together with Seda Manavoğlu. The approach of this workshop built upon experiences with their locative media project Coffee Deposits:::Topologies of Chance that they previously had carried out in Istanbul. Coffee Deposits:::Topologies of Chance (aka Siting Maps in Cups) began as a speculative project that I presented at the Locative Media conference in Siegen, Germany in 2007. For those not familiar with the Turkish (et al) coffee phenomena, it basically requires a blend of strong coffee that has been ground to a pulverized state, and is cooked over a stove until it boils several times, to be then served in small demitasse cups. 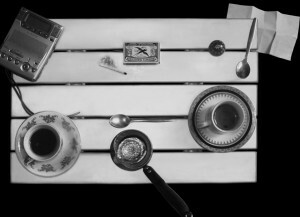 After drinking, the cup should be turned upside down onto the saucer, and once dried, the settled coffee sediments form intricate patterns and shapes that can be interpreted. For me, the cup thus is an ‘interface’ or lingua franca that stimulates prophetic speculation through image translation via a versed reader, and often generates ludic scenarios and conversations, and even forms of testimony. Our project’s initial intent was to build upon these cultural practices around the drinking of a cup of coffee. We wanted to explore the charting of layers, movement and dwelling in Istanbul through mobile and ad-hoc Turkish coffee encounters. We imagined that we would set up improvised mobile coffee stations with which to explore the city, arrange meetings and collect stories. We also would employ a combination of GPS traces and geocache tactics to document and augment the one-on-one encounters with artists, researchers and passersby. This documentation would then be contoured into an interactive environment (DVD-ROM) a hybrid between documentary and the ludic, whose interface would lead to an unfolding of counter-cartographies. Once in public space the project unraveled differently than the order outlined above, and took on other modulations, which are described throughout this text. Our trajectory as autonomous mobile coffee makers hinted at the revisiting of a little known and short-lived practice before coffee houses had their firm place in the Ottoman Empire (circa 16th century) and was part of coffee’s thorny migration beginning in Africa and proliferating to the Near/Middle East, Europe and beyond. Our street level coffee presence (also considering our own layers of alterity in Istanbul) was a stark paradox to the present day coffee establishments in Istanbul such as Starbucks and Gloria Jeans Café. Customers behind tinted windows and laptops peered in disdain (and some with delight) at our disorderly coffee construct from a safe distance. We began on the streets and café’s in Kadıköy (located on Istanbul’s Asian side) to first explore the curious coffee-fortune trade, which operates under scrutiny from the municipality. That is to say, there is a soft law, which was re-activated approximately in 2003 to regulate the trade of reading fortunes for money in cafes even though it is advertised everywhere but instead the slogan furtively reads, “Coffee is on you, the reading is on us.” This is related to a law (article 677) that was instituted in 1925 (as part of Atatürk’s reforms) banning clairvoyants, fortune-tellers, dervish lodges and Sufi orders etc. This was the same law that forbade the wearing of clothes associated with these titles. The ambivalence of coffee reading in public space implicitly affected our own mobility, as we became suspect of posing as undercover agents by a network of fortune-tellers. At a crucial point, we indeed shifted our protocols and decided to forego coffee encounters as a locus, and as well to postpone the geocaching segments, yet still documenting our process via audio, video and GPS data. Following a less result oriented trajectory and making space for the ‘courage for flux’ (in the spirit of Kierkegaard) was liberating in the sense that it allowed for unforeseen forms of exchange, and modes of agency such as in the way we conducted interviews, or how we made decisions to develop or follow disparate spatial and temporal narrative and documentary threads. Our adventitious detours led us to explore a multiplicity of converging, unpredictable and rapidly shifting urban patterns and diverse stories and accounts by those who inhabit, walk, dwell, witness, work and protest in the city. As film scholars Patricia Zimmerman and Dale Hudson have observed, “Locative media practices shift the terms of documentary media production. They move to interfaces, from refined arguments to contestations and speculations.”  In our case, the ambient mediums or phantom guides (coffee and GPS strategies) became a trope in which to negotiate, articulate and speculate multiple viewpoints and disorientations, sometimes ironically via diverging and non-linear traversals within screen and street interfaces. A sampling of in-situs include; street-level interviews with mobile junk recyclers who are seasonal migrant workers from Eastern Turkey, whose trade is encroaching upon obsolesce with pressure from the city and private waste companies. We traversed parts of Sulukule (Gypsy/Roma district) with artist and researcher Sevgi Ortaç who has done extensive research regarding the historic city walls and the problematic ‘urban transformation’ projects taking place in the area. Then to a more political walk taken with LGBTT activist and journalist Deniz Deniz who performed her daily walk through Istanbul’s Beyoğlu, district. She, amongst many others, was and still is a target for police harassment by issuing absurd and expensive traffic tickets during daylight hours, which attempt to keep transsexuals and transvestites from moving freely in the city. We navigated through a more palimpsestic lens with journalist ad historian Osman Köker where we revisit past Armenian presences (late Ottoman period), and into the present through several districts, often with the aid of historical postcards and in-transit interviews. With our speculative presentation/workshop title we sought to triangulate location aware practices, source materials, data or rather residual, and hybrid forms of documentary. While we converged many themes throughout the introduction and presentation of the DVD-ROM we sought to focus on geocaching for the workshop portion. The geocache element interjects a slightly alternative notion of data that is less about statistics or that which is networked, algorithmically generated, or centered on clusters of data visualization. Rather we wanted to evoke a cinematic register, which we playfully coined as, D.iegetic A.ttributes T.o A.ssemble. We illustrated how we are developing (spatial narrative) extensions to Topologies of Chance project with geocaching. Our deferred usage of geocaching strategies would now resurface as locational ‘postscripts’ (i.e. 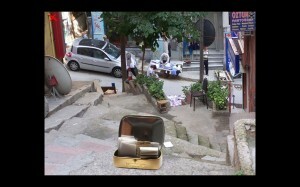 addendums or epilogues) by re/dis/locating fragments from our archive into urban space. When first embarking on this project a few years ago, one of the initial motivations to employ geocaching tactics was for its networked community, and that it is practiced globally and is reasonably accessible. I personally was also interested in the détournement of the thorny phenomenon of modern day treasure hunting (archeological objects, gold, etc. ), that has become part of the collective narrative and still very much alive in the eastern parts of Turkey (as well as in Istanbul). I have encountered this first hand by citizens who are keen on actively seeking out the gold and valuables hidden and buried by the Armenians who once inhabited the region. Such stories proliferate and are at once intriguing and disconcerting. We first outlined some of the ways in which the Geocaching web database and network operates, such as how one first finds and/or places geocaches online; using coordinates, the use of tags, logs, categories, sub-categories, etc. The workshop participants would later develop their own geocache placements and scenarios on paper in small groups. In short, geocaching is a worldwide network and game-like sport that uses geo coordinates and a GPS device find to hidden ‘caches’ (weather proof boxes, micro containers the size of your ring finger, retrofitted pipes, etc.) a hybrid between a low and hi-tech treasure hunt in rural and urban space. (See: www.Geocaching.com or www.Wayfaring.com). While there are many types of geocaches, we focused on the basic cache, the multi-cache and virtual caches and illustrated a few examples of local caches listed online situated in Istanbul. 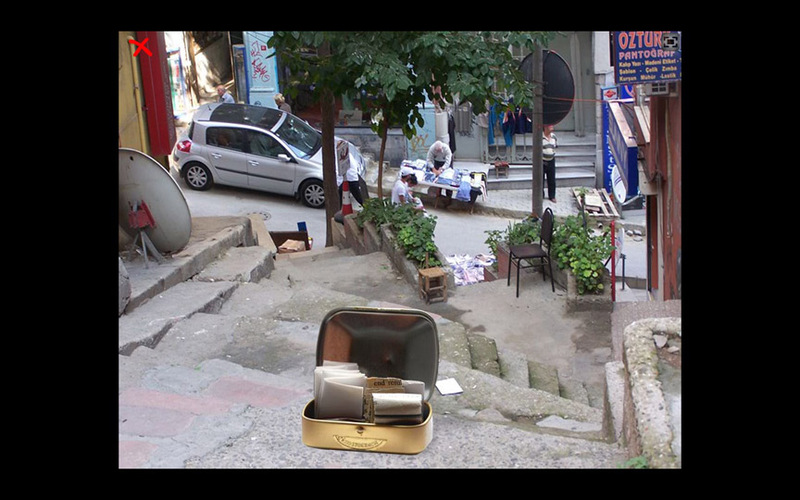 Then correspondingly we described (sorry no hints until we hide the cache) a post-script scenario related to our project’s narrative in the form of a multi-cache that we would place in nearby Beyoğlu, what we call the Virtual 39th Step. First the geocacher would arrive to the site in question via coordinates, although geocaching with GPS coordinates only gets you approximately to the actual cache, then it’s up to you to navigate the 5-10 or so meters to the exact spot. From there, once you find the cache, inside it has instructions of a series of directions and visual clues to then find the 2nd and 3rd cache. Ultimately these would lead to the final cache location that is hidden in a small sealed container with log book, pencil, a picture, a riddle and token for exchange. The dramaturgy of our multi-cache in Istanbul relies heavily on clues, passwords, chance and local guidance through the interaction of shopkeepers and street vendors that simulate more ‘analog’ re-articulations of GPS devices, which renders their futility in certain situations. Our participants consisted of local and international attendees, and included a class of architecture and design students who had just arrived from Northern Cyprus’ Dogu Akdeniz University (East Mediterranean University). Our first exercise was a preliminary warm-up to the geocaching segment by charting our individual routes to the Istanbul Modern. No matter how versed you are in navigating the cities various transportation arteries, all methods of movement require an acute sense of choreography, observation and space for happenstance. These maps could be drawn, spoken, performed or notated in any manner. This freeform mapping also collectively generated subjective ‘data’ for the second part of the exercise. It is interesting to note that many of the individual maps resembled filmic storyboards. These consisted of encounters that had triggered some sort of anxiety, confusion, curiosity, conversation or decision-making. Their subjective wayfaring detailed many observations on the way to Tophane, a collection of discrete parts from fleeting monuments or even nonu-ments, views from above, corners, teacups, mysterious structures, unused spaces, modes of transit, smells. One participant, traced more textually. (mode) Walking: a down hill walk. Meanwhile another person sketched a meticulous labyrinth of facades and scenarios in a relatively short amount of time. We were all drawn to a door he drew and described as always being open but with no one present no matter what time of day or night. 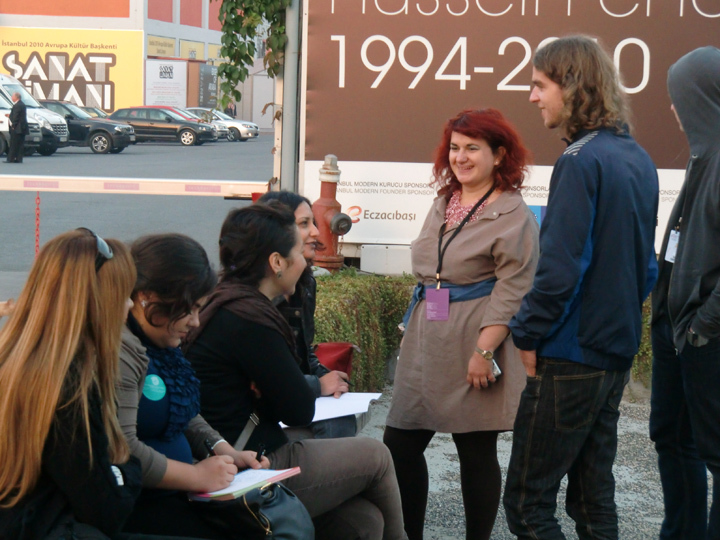 The groups converged throughout the grounds inside and outside of Istanbul Modern to discuss the 2nd part of the exercise to come up with geocache scenarios. The groups had all ultimately chosen to use the multi-cache format, as it evokes game like strategies and extra sleuthing skills to lead the viewer to many locations. They had also constructed their caches to involve shopkeepers and vendors, as these local contacts are the way of the street and offer a way in which to interact in unforeseen ways. For example one group’s multi-cache brings you to Taksim Square. For this you would not need a GPS device, as it’s an obvious landmark. The directions are as follows: ask a nearby tea seller, from which there are many for a glass of free hot water to take away. The one vendor who gives you the glass (sorry no paper cups), then tells you that will need to exchange that water for a glass of rakı, (Turkish liqueur flavored with anise) from a patisserie located on Istiklal Caddessi. In turn after entering and asking the right patisserie, instead of receiving of a glass of rakı, you get a free cake and coffee. Such simple task oriented objectives morph into a circuitous journey, and are likely to lead one to discover more than patisseries and rakı. Although not always evident in their scenarios why they decided to choose particular locations over others, but this perhaps reflects how one might easily get caught up in the game logic of how to get from cache to cache. This group also did not use the hiding of a physical cache or object in urban space, and what that would contain inside or might add to the game or locational elements. Likewise, by taking the workshop into the street would have stimulated and challenged the articulation of more complex strategies from the abstract to the tangible. Another group’s multi-cache (entitled the Worm Hole) did have a physical cache at the end, although you might have to get wet in order to find the container! Also to point out since many participants spoke Turkish, it was not clear how non-speakers would navigate the translations. And since it can be especially difficult to hide a cache in the city without someone seeing you, what is at stake is that they might possibly remove or destroy the cache. However these in the field glitches also nuance ways in which you hide, re-hide and find geo-caches. Tina Bastajian is a Los Angeles born film/media artist, currently a PhD researcher based in Amsterdam. She has predominately made single channel works that are between experimental documentary and narrative forms that often triangulate themes of displacement, translation and memory. In tandem, she is working in praxis and theory to chart and interrogate subjective mapping tendencies and archival proclivities in locative media practices that evoke and reconfigure themselves as potential geo-cinematic constellations. Co-collaborator, Seda Manovoglu often works with photography and documentary subjects within installation spaces that use theatrical components, and has recently attended the Masters of Arts program at the Dutch Art Institute. As film/media artists both are drawn to ad-hoc and intimate situations that interlace documentary, experiments in narrativity, re-enactment, work processes: working in and between themes of gender, identity, migration, etc. 1 Hudson, Dale and Patricia R. Zimmerman. “Taking Things Apart: Locative Media, Migratory Archives and Micropublics” Afterimage: The Journal of Media Arts and Cultural Criticism Vol. 36, No. 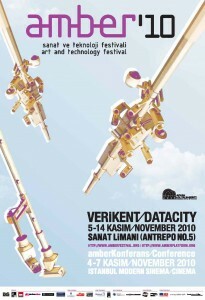 5 (2009). 2 Manovich, Lev, The Language of New Media. Cambridge: MIT Press, 2001. 3 Serres, Michel. Conversations on Science, Culture, and Time: Michel Serres with Bruno Latour. Trans. Roxanne Lapidus. Ann Arbor: Univ of Michigan Press, 1995.